In news that makes us say, “‘Bout flippin’ time…,” AMC announced that the premiere dates for the latest seasons of their hit shows Mad Men and The Killing. Season five for Mad Men will begin on March 25th and season two of The Killing on April 1st. AMC also announced that they have ordered 16 episodes of The Walking Dead, which is three more than the current season’s order of 13. The second half of season two of The Walking Dead premieres on February 12th. There’s also some information below about a new unscripted series featuring Kevin Smith called Comic Book Men that we’ve seen the trailer for but, to be honest, even as geeky as we are, what we saw didn’t excite us that much. Comic Book Men will be premiering immediately after the season 2.5 premier of The Walking Dead. Check out the two press releases below. The critically acclaimed second season of “The Walking Dead” returns at 9pm ET/PT with the new episode, “Nebraska.” February 12 also marks the return of AMC’s live after show, “Talking Dead,” at midnight ET. “The Walking Dead” season two continues to deliver the strongest telecasts for any drama in basic cable history against Adults 18-49. The series’ international premieres delivered equally impressive results in all major international TV markets, and broke pay-TV ratings’ records across the world. The series is led by a cast that includes Andrew Lincoln, Jon Bernthal, Sarah Wayne Callies, Laurie Holden, Jeffrey DeMunn, Steven Yeun, Chandler Riggs and Norman Reedus. Immediately following “The Walking Dead” is the premiere of AMC’s newest unscripted series, “Comic Book Men,”at 10pm ET/PT. Executive produced by Kevin Smith (Clerks, Chasing Amy), Charlie Corwin’s Original Media (“LA Ink,” “Storm Chasers”) and Elyse Seiden (Red State), the series (formerly titled “Secret Stash”) is set in Smith’s iconic comic shop Jay and Silent Bob’s Secret Stash, and captures the world of the neighborhood comic book store and fanboy culture. The season consists of 6 one-hour episodes. As one of the most highly anticipated season premieres of the year, the Emmy® and Golden Globe® Award-winning drama “Mad Men” is back with a two-hour season 5 premiere on Sunday, March 25 at 9pm ET/PT. Written by Matthew Weiner and directed by Jennifer Getzinger, the season premiere episode will also be available onamctv.com the Monday after air. Following the premiere, on Sunday, April 1, “Mad Men” will return to its regular timeslot at 10pm ET/PT with an episode written by Erin Levy and Matthew Weiner and directed by Jon Hamm. Fans looking to catch up on “Mad Men” can watch the fourth season On Demand, beginning Monday, January 23, or set their DVR every Sunday morning at 6:00am ET/PT when AMC continues to air episodes from seasons one through four (in order) leading up to the season five premiere. Created by Emmy® and Golden Globe® winner Matthew Weiner and produced by Lionsgate, “Mad Men” made history last September as the first basic cable series ever to win the Emmy® for Outstanding Drama Series in four consecutive years. “Mad Men” stars Golden Globe® winner Jon Hamm, Elisabeth Moss, Vincent Kartheiser, January Jones, John Slattery, Christina Hendricks, Jared Harris and Kiernan Shipka. 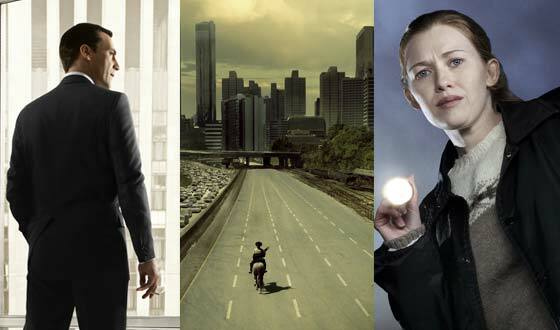 AMC’s hit series “The Killing” returns for its second season with a two-hour premiere on Sunday, April 1 at 8pm ET/PT. Following the premiere, on Sunday, April 8, “The Killing” is back to its regular timeslot at 9pm ET/PT. For those looking to catch up on the series, all 13 episodes from the Emmy® nominated first season will be available On Demand beginning Monday, March 5. Based on the Danish television series “Forbrydelson,” “The Killing” follows the police investigation of a young girl’s murder in Seattle and the hunt for her killer. Written and executive produced by Veena Sud, “The Killing” stars Mireille Enos, who garnered Emmy® and Golden Globe® Best Actress nominations for her portrayal of detective Sarah Linden, Joel Kinnaman, Billy Campbell, Michelle Forbes and Brent Sexton. Pasadena, CA – January 14, 2012 – AMC announced today from the Television Critics Association (TCA) Press Tour in Pasadena, CA that the third season of “The Walking Dead” will consist of 16 episodes. Previous season orders were for 13 episodes. AMC’s international broadcast partner FOX International Channels (FIC) will follow the 16 episode order and structure a similar schedule worldwide. Season two of the critically acclaimed global hit series continues to deliver the strongest telecasts for any drama in basic cable history against Adults 18-49, as well as, top international pay-TV ratings on Fox International Channels’ (FIC) major markets. “The Walking Dead” is based on the comic book series written by Robert Kirkman and published by Image Comics. Glen Mazzara serves as series’ showrunner and executive producer. Kirkman, Gale Anne Hurd, David Alpert and Frank Darabont are executive producers with Greg Nicotero as co-executive producer. “The Walking Dead” has received rave reviews from countless critics, both domestic and international, who heralded the series as “above all else, ‘The Walking Dead’ hasn’t lost the most important ingredient in its strangely successful recipe: it’s thrilling” (The Hollywood Reporter), “…with Dead’s riveting cast of characters, the personal dynamics are almost as potent as the gory thrills” (Us Weekly), “‘The Walking Dead’ is a feast. Dig in.” (The Guardian, UK), “It doesn’t even take three minutes to realize that this series is setting standards” (Der Tagesspiegel, Germany). “The Walking Dead” secured a 2010 Golden Globe®nomination for Best Television Series – Drama and won the 2011 Emmy® Award for Outstanding Prosthetic Makeup. The series tells the story of the months and years that follow after a zombie apocalypse. It follows a group of survivors, led by police officer Rick Grimes, who travel in search of a safe and secure home. FOX International Channels (FIC) is News Corporation’s international multi-media business. We develop, produce and distribute 300+ wholly- and majority-owned entertainment, factual, sports and movie channels across Latin America, Europe, Asia and Africa, in 35 languages. These networks and their related mobile, non-linear and high-definition extensions, reach over 400 million subscribing households (1 billion cumulative) worldwide. We also operate a global online advertising unit, .FOX (pronounced “dot-fox”) specialized in online video and display, and four TV production houses. In operation since: August 14, 1993. This entry was posted in TV NEWS and tagged amc network, mad men, premiere dates, series, television, the killing, the walking dead. Bookmark the permalink.